Ever since unusually ancient and deadly spear points were found near Clovis, New Mexico in the 1930s, many archeologists have believed that this type of weapon originated with the first settlers of the New World, who supposedly migrated from Asia at the end of the last ice age. 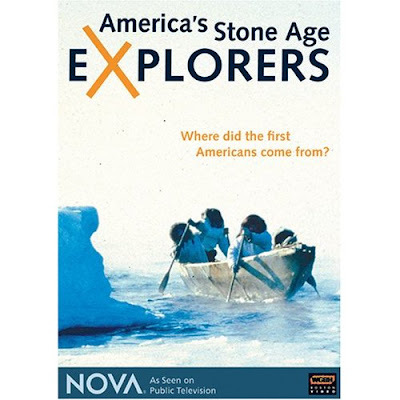 In "America's Stone Age Explorers," NOVA reports new evidence that challenges this widely held view. The hunt for clues takes NOVA to sites of stunning discoveries in western Pennsylvania and southern Chile; to southern France, where Stone Age artifacts have been found that resemble the famous Clovis points; to the high arctic to learn the techniques that may have been used to cross the ice-encrusted Atlantic 17,000 years before Columbus; and to a remarkable find in central Texas that may hold the key to who invented the Clovis technology. The distinctive design of a Clovis point (see The Fenn Cache) is perfect for killing big game, making it a Stone Age weapon of mass destruction. The Clovis point may even have been behind the extinction of large ice age mammals such as the mammoth (see End of the Big Beasts). 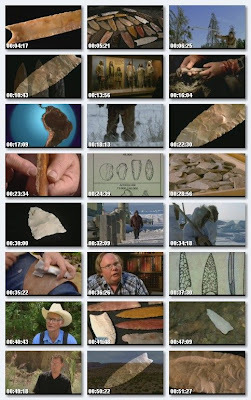 Clovis points have been found at archeological sites throughout North America, and for decades these sites represented the oldest accepted evidence of human presence in the New World. Many archeologists therefore concluded that hunters equipped with Clovis technology were the first settlers of the Americas and that they probably arrived from Asia at the end of the Ice Age about 13,500 years ago, when lower sea level allowed hunters to cross a land bridge connecting Siberia and Alaska. But there is growing evidence that humans were in the Americas long before the Clovis hunters (see Before Clovis). 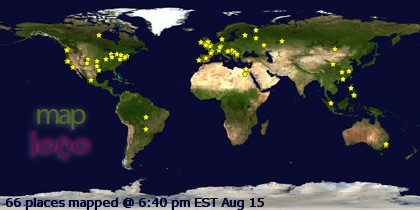 One of the best known of the possibly pre-Clovis sites is called Meadowcroft, near Pittsburgh, Pennsylvania. There, Jim Adovasio of Mercyhurst Archaeological Institute has been excavating artefacts well below the geological layer that corresponds to the Clovis period, although many archaeologists dispute his evidence. "A lot of people ... think that this is not only a repudiation of a well-accepted dogma, it's a repudiation of themselves," Adovasio says. Another promising pre-Clovis dig is Monte Verde in southern Chile, where archaeologist Tom Dillehay, formerly of the University of Kentucky, has made an unusually rich find half a world away from the Asian land bridge route. Also joining the debate are scientists using DNA analysis of current populations of Native Americans to look for clues of their ancestry—again with intriguing but controversial results. One team even proposes that the first Americans came from Europe, not Asia, based on the similarity of Clovis points to the weapons of the Solutreans, who lived about 17,000 years ago in what is now southern France and northern Spain. If the Solutreans ever crossed the Atlantic, they may have traveled like today's Eskimos, who make long journeys skirting ice floes in watertight skin boats, hunting arctic game as they go. Archaeologist Michael Collins of the University of Texas at Austin has an even more startling theory. The theory is based on his excavations at Gault, Texas, which show evidence of a more complex Clovis culture than ever imagined, including a diet that spans the food chain, evidence of a sophisticated trade network, hundreds of types of tools, and possibly the earliest example of art in the Americas. "Where did Clovis come from?" asks Collins. "The longstanding notion of the rapid spread of Clovis across the continent has been taken to mean the spread of a people across the continent. An alternative might be that the spread of Clovis is actually the expansion of a technology across existing populations—analogous to the fact you can go anywhere in the world and find people driving John Deere tractors." In other words, the Clovis point could be the first technological breakthrough in the Americas, invented by people who had long been resident here—and then adopted by their neighbours, who knew a good thing when they saw it.